The benefits of driving an electric vehicle (EV) are numerous. EVs pump less CO2 into the atmosphere and reduce noise pollution in cities. They are also becoming increasingly affordable for middle- and low-income consumers as demand drives down battery prices and governments implement national and local policies aimed at incentivizing EV growth. But although EVs are often touted for their sustainability, they nonetheless carry with them environmental concerns. This is especially true when it comes to their batteries, which typically must be replaced every seven to 10 years for smaller vehicles and three to four for larger ones, such as buses and vans; contain toxic chemicals that cannot simply be tossed into a landfill, and involve an intensive manufacturing process. Rather than being thrown out, batteries must be reused or recycled — and knowing how to do this can be tricky. As more and more electric vehicles take to the road in the coming years, understanding and accounting for the environmental ramifications of these vehicles will be paramount. Given the relative newness of the global electric vehicle market (10 years ago, consumer electric vehicles were nearly non-existent), the question of battery recycling is just coming to the forefront now. As of this year, pioneering first-generation electric vehicle models such as the 2010 Nissan Leaf are being retired and replaced with newer models. This also means that for those early models, owners must soon replace their batteries, as well. Most EVs run on lithium-ion batteries. These types of batteries can be found in everything from digital cameras to smartphones to remote control toys. Making them is an intensive process that involves mining rare earth metals and transporting them for long distances, which can take a huge toll on the environment. As the Los Angeles Times notes, manufacturing new electric vehicle batteries also require mining cobalt from the Democratic Republic of the Congo, a country that is in the midst of a civil war. Currently, however, it’s estimated that only about 5% of lithium-ion batteries that power various home electronics and other goods are recycled. This build-up will only increase as electric vehicles continue to gain popularity. It has been estimated that as many as 11 million tons of used lithium-ion batteries could accumulate worldwide between now and 2030. As car batteries are spent and replaced, finding ways to recycle and reuse them can reduce the need for additional resource extraction, which is good for the environment and for human rights. Policymakers are recognizing this, as well. In China and the European Union, electric vehicle owners are required by law to recycle or reuse their batteries, and experts expect the United States to soon implement similar policies, Bloomberg reports. Although electric car batteries are no longer fit to power an electric vehicle after seven to 10 years (or four for a larger vehicle) of use, they still contain about 70% of their capacity when they’re retired, according to The Guardian. When this is the case, they can be repurposed in a number of creative ways. Additionally, they can be recycled through smelting, direct recovery, and other, newer processes. What can I do with my old battery? In the past few years, a number of companies have emerged to help consumers reuse and recycle EV batteries. Others yet are developing new technologies to improve upon existing recycling processes. The first thing you can do with your old battery is, recycle it. In the US, California-based Redwood Materials and Retriev Technologies will evaluate your materials and sustainably recycle them. OnTo Technology, based in Oregon, is also pioneering advanced battery recycling processes. As these processes continue to develop, reusing batteries offers a popular third route. Although Tesla is looking to improve recycling, other manufacturers like Nissan and Renault are using old batteries to provide new services. In Japan, Nissan repurposed batteries to power streetlights. Renault has batteries backing up elevators in Paris. And GM is backing up its data center in Michigan with used Chevy Volt batteries. Old batteries can also be useful for storing solar energy and backing up traditional electrical grids, according to Bloomberg. In addition, private companies like the UK-based Powervault and Australia-based Aceleron have created technologies that can turn batteries into home electricity storage units, electric bike batteries, and other useful tools. 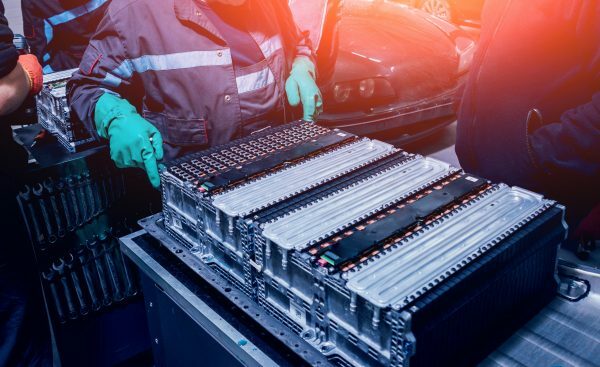 As the electric vehicle market continues to heat up, implementing best practices for battery recycling and reuse may well become a hot-button topic for car owners and policymakers alike. This past year, the number of EVs worldwide surpassed 3 million for the first time ever. But that number pales in comparison to what has been forecast. In the next two decades, electric vehicles are poised to explode onto the scene in a serious way, with as many as 559 million electric vehicles expected to be on the roads by 2040 — or about one-third of all cars. What to do with used EV batteries as vehicle production ramps up is certainly a major challenge, but it also presents an unprecedented opportunity for manufacturers and governments to work together to bring about cleaner technology not just for cars, but across the entire electricity grid.